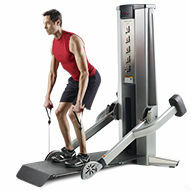 The FreeMotion Lift Machine provides users with an easy and effective way to get a great total body workout! It is also ADA compliant to accommodate wheelchair users. Designed with multiple users in mind, the FreeMotion Lift Machine offers the benefits of multiple exercises in one effective and durable workout machine! Dimensions (LWH): 72" x 36" x 74"